Food Bank staff members Ryan VanMaldegen and Katie Auwers unload donations during Stamp Out Hunger 2015. 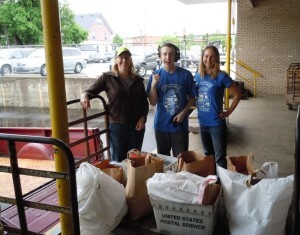 Grand Rapids, Michigan — May 12, 2015 — The 23rd-annual Stamp Out Hunger Food Drive collected roughly 62,000 pounds of food in Grand Rapids on Saturday. The food, which ranged from boxes of cereal and pasta to cans of soup, will be distributed to food pantries and other hunger relief agencies by Feeding America West Michigan Food Bank. 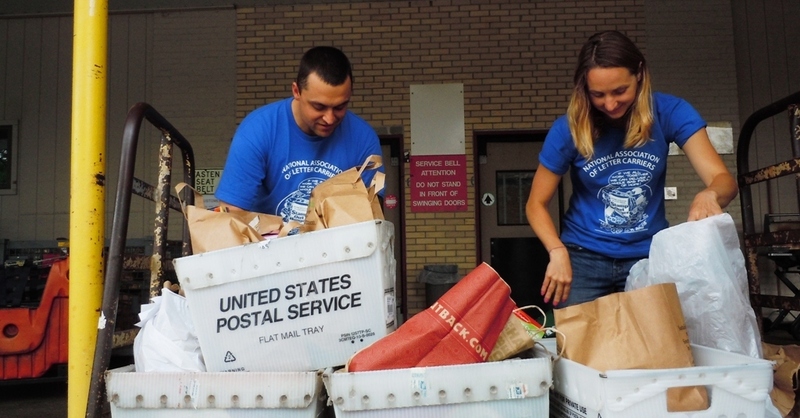 Stamp Out Hunger is coordinated by the National Association of Letter Carriers. Volunteers Lisa and Evan Plite helped Katie Auwers and other Food Bank staff during Saturday’s food drive. All told, Feeding America West Michigan was able to distribute a record-setting 26.5 million pounds of food in 2014, most of it donated by farmers, retailers and manufacturers. Year to date, the Food Bank is currently 11.5 percent ahead of last year in total food received. 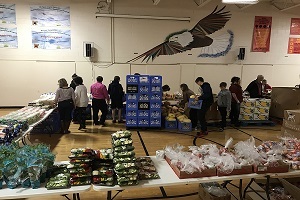 Though they make up a small percentage of the whole, food drives like Stamp Out Hunger provide an assortment of nonperishable goods that are not often donated otherwise. 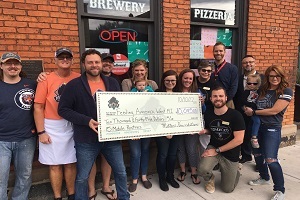 “As they do every year, the Grand Rapids letter carriers put in an enormous amount of extra work to make this happen, taking time out of their busy work days to haul bags of food through the rain and help us load them onto our trucks. We’re grateful to them and to everyone who gave this year,” Estelle said. To get involved with the ongoing effort to solve hunger, visit feedwm.org. About Feeding America West Michigan Food Bank. 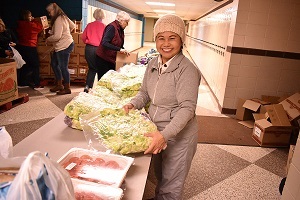 Serving local families in need since 1981, Feeding America West Michigan Food Bank reclaims safe surplus food from farmers, manufacturers, distributors and retailers. 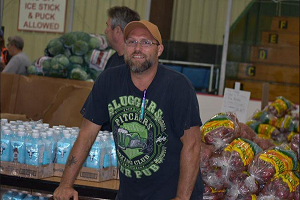 We distribute that food through a network of more than 1,100 food pantries, soup kitchens, and shelters in 40 counties from the Indiana border through the Upper Peninsula. 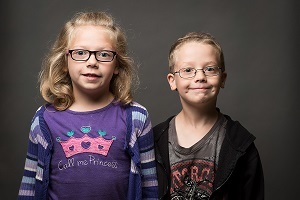 Each year, an estimated 492,100 people receive food from Feeding America West Michigan. For more information, visit feedwm.org. About the National Association of Letter Carriers. Founded in 1889, NALC is the union of city letter carriers employed by the U.S. Postal Service, delivering mail, six days a week, to more than 150 million homes and businesses in every city, suburb and town in America. For more information, visit NALC.org.